Before having bariatric surgery you might not have been aware of the connection between chewing well and maintaining a healthy digestive system. Did you ever think you would need to mindful of every mouthful? Probably not! I know I didn’t. For most people chewing is an unconscious reflex, or a subconscious habit. You take a bite, start to chew and the rest takes care of itself. The problem is we often swallow far too quickly out of our eagerness to feel satisfied. Chewing (or mastication) is actually very important as the first stage of the digestive process. The time we take to breakdown our food as we eat has a significant impact our digestive health. The gastric band or gastric sleeve bypass can make it difficult to absorb essential nutrients and minerals. Malabsorbtion occurs after a portion of the stomach is removed and the capacity to digest nutrients is restricted. Chewing is a way to maximise the nutrients you get from smaller portions. 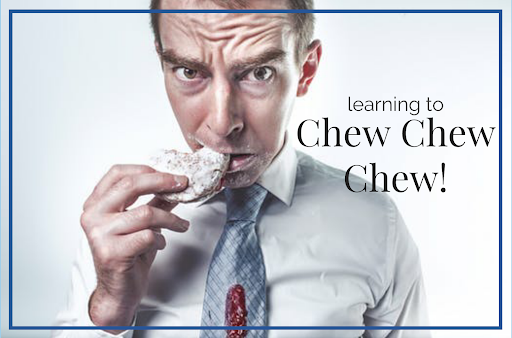 Chew well to break food down into smaller particles that can be more easily digested by the stomach. When we swallow large chunks of food without chewing to liquefaction, particles of food can get lodged in the GI Tract and cause symptoms. Undigested food particles are pushed through without being absorbed properly. If we don’t chew well we miss out on more nutrients. Portion control is essential to weight loss. Chewing for longer is a good way achieve satisfaction before reaching the point of fullness. Making surgery a success depends on your ability to develop healthier eating habits. Taking your time over eating is good training for slowing down and eating less. The longer we spend chewing and digesting nutrients the less calories we need throughout the day. Chewing well forces us to slow down at mealtimes. Losing the feeling of hunger is a side effect of surgery, so it's often difficult for patients to tell when we are hungry and when we are full. Prior to surgery it would take around 20 minutes for the brain to signal to the stomach that it is full. During recovery it can be a struggle to recognise the feeling of fullness which it is better to stop eating after a period of 20 minutes. Eating smaller portions and chewing well makes meals last for longer and helps nutrients to go further. The longer we spend chewing the more saliva we produce. Saliva contains digestive enzymes that are needed to break down food particles. These enzymes make the digestion process much easier on your smaller stomach and aid the journey through the intestines. Our body uses the enzymes we produce in our saliva to break down fats from the foods we consume. The saliva we produce in the act of chewing well also serves to soften and lubricate, so it passes through the esophagus with greater ease. As we chew food we are already pre-digesting particles as the food becomes liquefied; again, making it easier to digest. Digestion can tax the mind and body of energy reserves. Chewing well allows your smaller stomach to work more efficiently and break down food more quickly and effectively. While chewing is essential for eating, chewing without eating food can be counterproductive to weight loss. For instance, as you chew a piece of gum you are sending your body physical signals that food is about to enter your body. This activates and releases digestive enzymes and acids without being spent on a purpose. Chewing gum can cause bloating by the overproduction of stomach acids which can lead to health issues for your smaller stomach and reconstructed digestive system. “Nature will castigate those who don’t masticate” said Horace Fletcher, a 19th century American health food enthusiast and early protagonist of calorie counting. He was also known as ‘The Great Masticator’ for advising that his method of chewing food at least 100 times before swallowing will increase strength and reduce the waistline. While Fletcher’s evangelism for prolonged chewing to the point of liquefaction might seem eccentric today, in the Victorian era he amassed many followers (John. D. Rockefeller, Thomas Edison, Franz Kafka and Henry James were among the converted) as he held lectures on his nutritional theories around the United States. Fletcher was not the first advocate of the benefits of chewing your food well. Ayurveda is an ancient philosophical system of life (ayur) and knowledge (veda) that emerged on the Indian continent around 5,000 BCE. As a traditional medicinal system, the teachings of Ayurveda place a special emphasis on diet and food and is still practiced today. Ayurveda recommends eating only when you are hungry and filling only one-third the capacity of your stomach, so that body is at optimal condition for proper digestion. Concerning the gastrointestinal tract Ayurveda teaches that thorough chewing is a potent remedy for digestive ailments such as fermentation in the gut which causes gas and bloating, also constipation and sluggish digestion. By not chewing food to liquefaction the stomach is forced to deploy fatty acids to break down large chunks of food, taking up more life energy for the digestive process than is necessary if only food is chewed properly before being swallowed. In the west, traditional practices of medicine and folk medicines are classed as pseudoscientific because the results often do not stand up against rigorous scientific measurements. We do not know for certain if Horace Fletcher took his theory on chewing from Ayurvedic philosophy; however, the method of chewing over 20 times has since been tested in numerous scientific studies which all reveal a strong correlation between prolonged chewing and weight loss.